This week, RHINO Steel Building Systems races past a metal building milestone as we complete our twentieth year in operation. 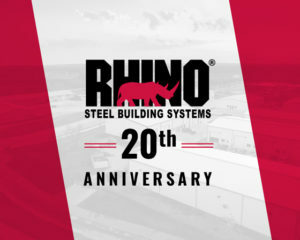 We believed from day one that RHINO would become a premier steel building company. In fact, we were determined to make it so. Our business model centered on a simple premise: deliver high-quality metal buildings and spectacular service at reasonable prices. Not only have RHINO’s building sales increased year after year, so have the number of our repeat customers. Such customer loyalty is unheard of in this business. Yet, over one-third of all our orders in the past year came from returning buyers and customer referrals. We believe that says a lot about our company. When we checked twenty years of our records, we found RHINO shipments top 41 MILLION square feet. That is enough steel to completely cover 712 football fields! Surprisingly, the 40’ x 60’ steel building remains our most popular size year after year. RHINO’s strong steel buildings now dot the landscape of every state in the U.S., as well as all across Canada and Mexico. We have even shipped structures to exotic locales across the globe, including Pago Pago and Bora Bora. And RHINO’s sturdy steel buildings withstood the test of time, too. To date, there have been no reports of any structural damage to even one of our steel buildings from natural disasters like hurricanes, earthquakes, or lightning. Although we tout the versatility of our steel framing systems, even we have been surprised by the variety of uses our imaginative customers find for our metal buildings. As we plan for the future, we continue keeping our eyes on our next metal building milestone. The coming decades will certainly present challenges, but we cannot wait to see what happens next. Be a part of the future with RHINO Steel Building Systems, a company whose products and customer service stand out from the common herd. Call RHINO today at 940.383.9566 with the specifications for your next building project. We will gladly supply you with free estimates and information. Share the post "RHINO Reaches a Metal Building Milestone"